KILLED AT THE BATTLE OF LOOS. 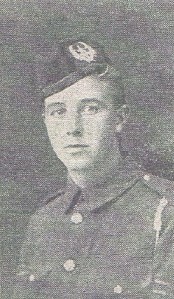 People of Briercliffe will regret to learn that Corporal Fred Kenyon, of the 10th Battalion Scottish Rifles, is reported from headquarters in Rouen to have been killed in action on September 25th, whilst taking part in the battle of Loos. His parents, Mr. and Mrs. T. Kenyon, who reside at 2, Halifax road, Briercliffe, have been very anxious about him ever since the fight at Loos. They have received information from a friend of their son, who is out in France, that he was "gassed", and died from the effects. Corporal Kenyon had always attended Elim Sunday School, and for several years he had worked at Walshaw Mill, Briercliffe. He enlisted on September 3rd, 1914, and went out to France in July of this year. His friends have always spoken highly of him, and the men of his battalion thought much of him. He was one of a bomb-throwing party, and one of the first over the parapet in the fights. His parents have the deep sympathy of the villagers. Corporal Kenyon's cousin, Gunner H. Tattersall, 9th Battalion R.F.A., son of Mr. and Mrs. John Tattersall, of 11, Abinger-street, Burnley, was killed in France on October 18th. He was 20 years of age, and prior to enlisting after the outbreak of war worked at Messrs. West's, Rake Head Mill. He had been in France since August 29th, and news of his death was received on Sunday, in a letter from Captain G. L. Warren, who stated that he had been killed by a German shell. Like his cousin he was a regular attender at Elim ? Methodist Sunday School.